A step-by-step method for choosing the way you want to feel and accessing genuinely happier feelings. You can reprogram your subconscious in as little as 17 seconds. A step-by-step method to experience the feelings you want to have. The control you do have over your subconscious feelings. A faster and easier to go from a low vibration to a high vibration. Today’s episode is all about wrangling your subconscious to give you the conscious experiences you want to have. Feelings of contentment, eagerness, optimism, and joy. Listen in today as I share everything I’ve learned about the way our subconscious deals with emotions and how you can take control and access the better emotions you want to feel. When we understand how something works – it’s easier to manage. This is the science behind our feelings! Our bonus content this week gives you the specific steps you can take to get into a better feeling state, so be sure to download the one-page worksheet which will teach you “How To Choose The Way You Want to Feel” by clicking HERE. I’m your host, Annie Kip, and today I’m going to share with you a trick I discovered. It’s literally something you can do every single time you are starting to notice feelings that you don’t want to have. This it s way to literally re-program your subconscious – and it’s more than just “think your happy thoughts” and believe that everything will all be okay. That doesn’t work for me. And if you’ve been trying to just be positive, you have probably found that it doesn’t work for you either. I know how ridiculous it is to say that to someone who’s feeling down. Just saying the words doesn’t work – but I’ve found that this technique really works for me when I’m feeling down. We’ve talked on this podcast about energetic vibration – and how that is tied to what you experience in your conscious reality. When you’re in a low mood, you can get sort of stuck in that low energetic vibrational place. I know what it’s like to be in a low mood. When things are challenging with my kids, particularly, I found myself getting down and a little blue. I knew I should just get out and go for a walk to try to shake off the mood, but honestly, I didn’t feel like it. I was just sort of stuck in my blue mood and needed a way to get myself out of it that didn’t take a lot of effort. I also noticed that there were times in my life when I could feel the higher energetic vibration. Sometimes, it had to do with what was going on – like after a really great meeting with a client or spending a great weekend with the beau. But there were times when a good feeling would seem to materialize out of nowhere and I wanted more of that. I’d find myself smiling at a thought or sort of car-dancing when as Earth, Wind, and Fire song came on the radio. Yes, I’m a girl who still loves all of the 80’s R and B and disco – from Al Jerreau to Rick James to The Commodores. Yes, I love them all. And you can’t stop me from dancing if they’re playing – but we can’t always be blasting Boogie Wonderland, now can we? I was interested in figuring out how to get more of that good feeling more of the time. If it came out of nowhere and felt so real that I could feel it in my body, I thought we must be able to summon it or conjure it up somehow. It was in listening to a recording of Abraham-Hicks in which they were simply asking a person whether they would rather feel “happy” or “sad,” Discouraged” or “encouraged,” bored” or “passionate” – and it gave me the idea to make this into a meditative process for myself. Abraham-Hicks says that it takes a minimum of 17 seconds of pure thought to activate the vibrational energy – and if you can string together several sessions of 17 seconds of pure, focused feeling and thought – you can actually make the vibration strong enough to start manifestation of those feelings and thoughts. If you can increase the time up to 68 seconds, you’re really getting into a powerful place of managing your thoughts and energetic vibration. Being down is a very low vibrational frequency – and it helps to have this process to follow without having to think. It’s a way of just “being” in the feeling you would rather be having. You know I’m not a doctor and I’m just sharing what I’m learning along the way – but if you’re feeling a little blue or stressed out or discouraged — or if you just want to know what it feels like to actually raise your vibration – I invite you to give this a try. I am excited to share this with you because it’s something anyone can do, anytime, anywhere. And you don’t have to like 80’s R&B and you don’t have to dance. In fact, I start this exercise right where you are. In your own funky town – the blue place full of feelings you don’t really want to be having. Instead, of jumping right to the happy feeling you want, my suggestion is the create the real good feelings you want to have in baby steps. This is based on my understanding that you have to feel a feeling, really feel it in your body, for your brain to accept it. Simply saying happy things to yourself doesn’t work – as anyone who’s been told to “just relax” or “calm down” or “get happy” can tell you. That doesn’t work. To me, it feels like the feeling it just outside of my reach. When I say things like that to myself, it just doesn’t stick. At the end of this episode, I’m going to do this with you – right on this recording, so you can queue it up anytime you need a little boost. We’re going to do it together and I’m going to guide you so you can learn to do it for yourself. I’ve also made a one-page worksheet called “How To Choose The Way You Want To Feel” for this episode’s Bonus Content to get you started on your own. You can use the words on this one-page sheet to get all the benefit I am going to describe to you now. Or you can take my example and create something that is unique for you. Usually, I do this first thing in the morning but I also do it whenever I’m feeling stressed or overwhelmed. For instance, if I feel like my work is sort of a struggle. Or I’m feeling distracted or getting down about something. It only takes a few minutes and you can do it whenever and as many times it it makes sense for you. I use the Timer function on my iPhone and a list of words – first a word that identifies the feeling I don’t want, and then a word that is the opposite of that word. I think this will make more sense as I show you how it works. First I set my timer to 17 seconds – but I don’t start it yet. I start by just sitting still, closing my eyes, and letting myself feel the bad feeling just for a few seconds – for example struggle. I don’t fight it, I just sort of get into it for a few seconds, instead of resisting it – just for a few seconds. In the example of “struggle” – first, I might imagine how it feels when I’m working on a podcast and can’t get the right words to say what I want to say. I’m at my desk and staring out the window and panicking a little that I’m wasting time and I’ve got other things to do and my shoulders are hunching up and I’m getting tighter and tighter. I sit in “struggle” just until I can really feel it – and then I imagine the opposite. The opposite of struggle would feel like ease to me. At this point, I press the Start button and imagine the same scenario if ease were there instead of struggle. I close my eyes and for a full 17 seconds, I really try to get into the opposite feeling. I let this word and the feelings associated with it just wash over me, like a warm shower. In my mind, I imagine specific examples of how it would feel – how it would show up in my life, what my body would feel like if I had the opposite feeling. When there’s ease, I can’t type fast enough because the words just flow out of me. I get into this feeling and try to really feel my fingers flying across my keyboard, typing, typing typing. And I try to feel how satisfying it feels when my words come out so easily and just make sense. I’m excited about the things I want to say and new insights I come to as I write and I think and before I know it – I’ve got a podcast written and ready to go. Then I imagine myself sitting down to record it and I feel how the words just flow so naturally out of my mouth. It feels so good to get it done so easily. By now the 17-seconds have gone by and the alarm has chimed. Optimally, you move right on to the next unwanted emotion word and it’s opposite word. The more times you spend 17 seconds imagining and really getting into the positive emotion, the better and better you will feel. If you can increase the time you focus on the positive emotion from 17 to 34 and then to 51 all the way to 68 that’s awesome – the more solidly you will be reprogramming your subconscious to feel the way you want to feel and activating that vibrational energy in your life. You are giving your brain the actual body-experience of those emotions you want to be having. You are reprogramming your brain’s neural pathways to be more comfortable and familiar with the positive emotions than the negative emotions. I’ve been doing this as a meditation in the morning and I can tell you it is making a huge difference for me all day. I feel much more settled and more aligned with the lighter, happier, easier feelings I want to have inside. I’m more aware when I’m not in a mindset that is helpful to me too – now that I know I can just go through this exercise to get access to the feelings I would rather have. If you’d like to try this, stop what you’re doing for a second. Pause this recording and get yourself to a place where you can take a few minutes to sit quietly by yourself. I’m going to guide you through this with my own timer – all you have to do is imagine the words I’m telling you and try to feel the feelings in your body as I talk. Really dig in to the sensations as much as you can. Give yourself over to this for a few minutes and I guarantee you will feel better after. Okay – are you ready? Now put aside worried and get into the feeling of “confident” for 17 seconds. Now…open your eyes and sort of let it sink in. How do you feel? I know when I do this exercise and really feeling the feelings, I feel lighter and freer when I’m done. And everything seems a little easier. I find that I get more done and generally feel better – sort of easy and on top of things – all day. In the Bonus Content, I’m sharing this list of words so you can try this immediately. It’s just a way to focus your feelings. And even though it’s sort of nice to just have a pre-made list and jump in, but I encourage you to make your own list. There might be particular bad feelings that seem to plague you all the time and you might have different words to describe the your feelings. 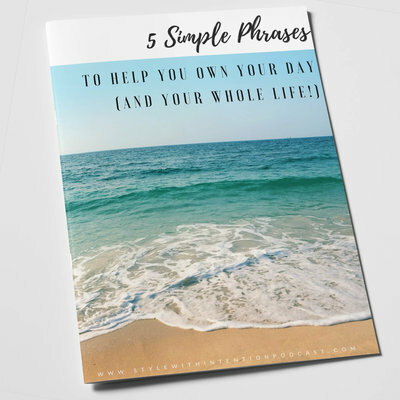 Your list doesn’t have to be in any special order – it just has to be words that help you really conjure up the feelings so you can feel them in your body. I hope you got a really good feeling from this little exercise! 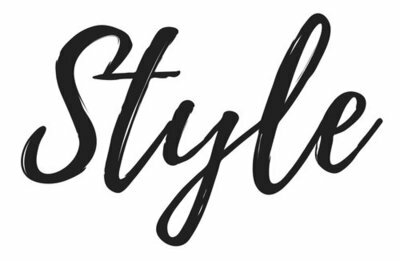 Come on over to the Style With Intention Podcast website and send me a note or follow me on Instagram @AnnieKipStyle – I’d love to know how this worked for you! I’m always looking for ways to get into that good feeling state that I want to live more of my time in and share them with you – because I know that’s where all the good stuff in life happens for all of us! Until next week, keep setting up your life so that it naturally helps you feel more the way you want to feel everyday, because happy looks really, really good!